Have you read the Help document that comes with PerfectTablePlan? This contains the answers to many questions. In particular you should consult the 'How do I' section for Windows or Mac. Q. Why haven't I received my licence key? Q. Why doesn't my licence key work? Q. Can I install my licence key on another machine? Q. Can I share my licence key with someone else? Q. Can I transfer my licence to someone else? Q. I've lost my licence key, can you re-send it? Q. What upgrades am I entitled to when I purchase a licence key? Q. Can I buy a single licence for my whole organization? Q. Can I upgrade edition, e.g. from Home to Advanced? Q. How do I get the installer to work? Q. How do I install a version upgrade? Q. How do I transfer PerfectTablePlan from one machine to another? Q. Can I use PerfectTablePlan from a memory stick? Q. How do I download versions of PerfectTablePlan older than the current one? Q. Can I install PerfectTablePlan 'unattended' on Windows? Q. What formats is the installer available in? Q. Can PerfectTablePlan be deployed via Windows Terminal Server/Citrix? Q. How do I copy a plan from one machine to another? Q. How do I share a single plan file between multiple computers/users? Q. How do I get PerfectTablePlan to start when I double click on a plan file? Q. Does PerfectTablePlan support E-shaped tables? Q. 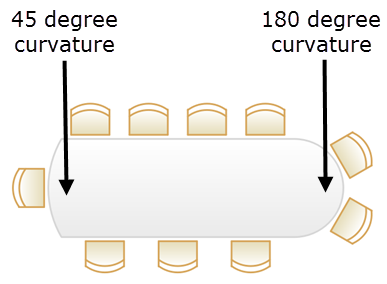 Does PerfectTablePlan support curved/serpentine/C-shaped tables? Q. Does PerfectTablePlan support horseshoe-shaped tables? Q. Does PerfectTablePlan support round-ended tables? Q. Does PerfectTablePlan support oval and semi-circular tables? Q. I get a 'No printer detected' message. I can see printers in my Windows Control Panel. Why can't PerfectTablePlan see them? Q. Why do I see "Action cancelled"#8221; when I try to access the online help in Windows? Q. Can I buy PerfectTablePlan on CD? Q. What languages is PerfectTablePlan available in? Q. Is PerfectTablePlan available in my web browser? Q. Is PerfectTablePlan available for Windows? Q. Is PerfectTablePlan available for Microsoft Surface? Q. Is PerfectTablePlan available for Mac? Q. Is PerfectTablePlan available for iPad/iPhone/Android? Q. Is PerfectTablePlan available for Linux? Q. How does the automatic seat assignment work? Q. Can PerfectTablePlan be used for optimization problems not related to seating, e.g. assigning golf fours? Q. How many guests can PerfectTablePlan handle? Q. How do I decide who to put next to who? Q. How do I get a receipt for my purchase? Q. What is the ECCN for PerfectTablePlan? Q. My organization is exempt from tax. How do I avoid paying tax? Q. I still can't find the answer to my question. How do I get help? If you pay by credit card our server automatically sends out a temporary licence key on completion of your purchase. We then check all your details and send you a permanent licence key before the temporary key expires. Yes. Use our automatic licence key retrieval system. Note that we moved from v5 to v6 in October 2018. It is easy to make a mistake copying a key 'by hand'. To ensure that you have correctly copied the licence key, please copy and paste it from the licence key email you have already received. To ensure you have the correct version of the software installed, please check the About window (see the top of this page). You can download the latest version of PerfectTablePlan from here. On Windows, PerfectTablePlan stores your licence key in the Windows system registry. It is possible that your anti-virus/security software is interfering with this. If none of the above works, try temporarily disabling your anti-virus/security software and trying again. A Windows program called 'reimage' seems to cause particular problems. The version of PerfectTablePlan (e.g. v6.0.2). Your operating system (e.g. Windows 10 or macOS 10.14). The error message you get when you try to enter your key. Yes. You can install PerfectTablePlan on as many machines as you like, as long as it is for your own use. For more details see licensing. Yes. From v6.0.0 your preferences can be stored portably on a memory stick/USB key. Set Preferences>General>Store these preferences in to a portable .ini file. Generally, no, unless you have an organizational licence. Standard individual licence keys are valid for one named person on any number of different machines and are not transferrable. We make a special exception for couples or 2 immediate family members planning a wedding, who may share a licence key. For more details see licensing. No, unless you have an organizational licence. Yes, ask us to quote you for an organizational licence. Yes, you can upgrade from v6 Home to v6 Advanced or from v6 Advanced to v6 Professional here. If you have v5 or earlier you need to upgrade to v6 first. Windows: The step-by-step guides to download, installation, starting and the Windows troubleshooting guide. Mac: The Mac troubleshooting guide. You can download older versions of PerfectTablePlan from here. Alternatively, you can upgrade to the latest version for a small fee. PerfectTablePlan installation does not require a reboot. More information on Inno Setup installer switches is here. Yes. From v5 onwards PerfectTablePlan Advanced and Professional editions have an E-shaped table type that can be used to create E-shaped tables with a top section and 2-25 sprigs. Before v5 and in v5 onward Home edition an E-shaped table can be created by placing together head tables and rectangular tables with seats down 2 sides. See the masonic example plans installed with the software. PerfectTablePlan can also handle an E-shaped table with no central sprig. Yes. From v6 onwards PerfectTablePlan Advanced and Professional editions have a serpentine table type. Yes. From v6 onwards PerfectTablePlan Advanced and Professional editions have a serpentine table type, which can be combined with custom tables to create a horseshoe-shaped table. See also the horseshoe-shaped table sample shipped with PerfectTablePlan. Yes. From v6 onwards PerfectTablePlan the custom table type has an option to have 1 or 2 rounded ends. There is no hard upper limit on the number of guests. Customers have successfully used PerfectTablePlan for events with over 4,000 guests. However, if you use the automatic seat assignment, the time required does go up considerably with the number of guests - this is in the nature of combinatorial problems. 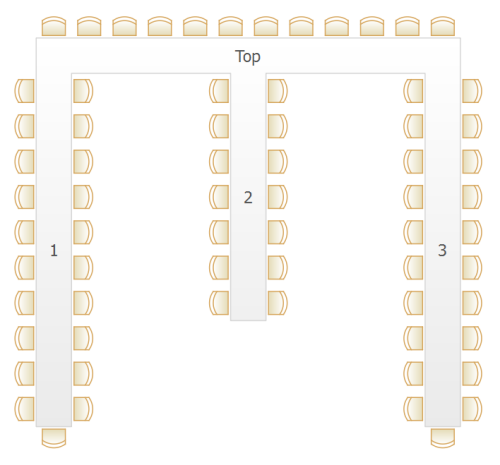 If you have more than 1,000 guests you might need to take a tea/coffee break if you run the automatic seat assignment. If that seems a little slow, imagine how long it would take you with scraps of paper! A version x licence key is valid for all version x releases of the software. For example a version 6 licence key will work for versions 6.0.0 and 6.1.0 of the software. If we make a new major release within 3 months of your purchase we will upgrade your licence key to the next major versions for free. If we make a new major release more than 3 months after your purchase you will be able to upgrade at a discounted price. If you want to be informed of future versions you should subscribe to our newsletter. The automatic layout uses a scoring approach to determine how good an assignment is and a genetic algorithm to try to find the best one. Because of the vast numbers of possible seating layouts it cannot be guaranteed to find absolutely the best (highest scoring) layout. However it will usually get quite close very quickly. Yes! PerfectTablePlan 6 supports Windows 7 or later. PerfectTablePlan should run on Microsoft Surface devices with the Windows Pro operating system. But not those with the Windows RT operating system. Download our free trial to check. Yes! PerfectTablePlan 6 supports macOS 10.14 to 10.11.
export to PDF and share these with your device by email, DropBox or other methods. Another approach is to use the free LogMeIn iPad app to access PerfectTablePlan on your PC or Mac from your iPad. No. We have been informed that it runs fine under WINE, but we haven't tested for this and recommend you try it yourself before purchasing. That depends on what sort of event you are organizing. Check our tips pages. Install the software on the new machine from our download page (if your key is not for v6 you can download older versions of PerfectTablePlan here). Re-enter it in the Licence window of the new machine. See also copying plan files. Note that PerfectTablePlan is licensed per person (not per computer). So it is ok to have it installed on more than one computer, for your own use. See licensing for more details. No. We no longer sell CDs. But you can download the PerfectTablePlan installer from our website and burn your own CD. PerfectTablePlan is currently only available in English. However the software is fully Unicode enabled, so it can handle a wide range of non-English characters. 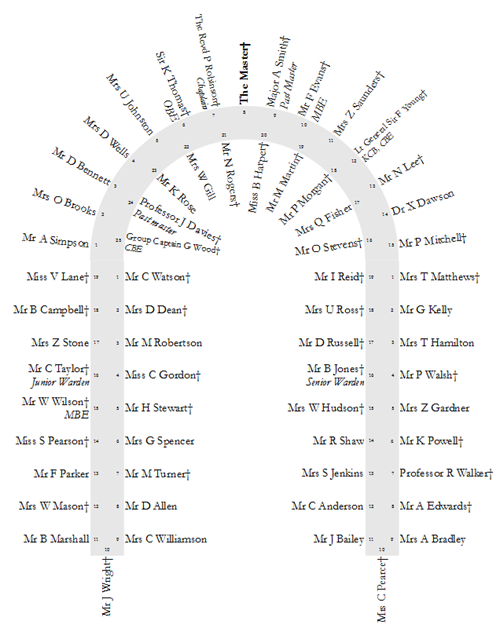 Also, from v4.1.0, you can change any of the words that appear inside the Guest chart, Table plan or Report panes, e.g. you can change the column headers in the Guest chart pane into German, French or Spanish equivalents. You can even move a plan file from Windows to Mac (or vice versa) without problems. Select File>Find... in PerfectTablePlan to search your harddisk for plan files. See also: How do I share a single plan file between multiple computers/users? Q. Why do I see "Action cancelled" when I try to access the online help in Windows? you can use the Terms tab in the Preferences window to remove any references to 'Table' or 'Seat' in charts and reports. Furthermore PerfectTablePlan v5 onwards has the ability to export to web. Allowing you to access (but not edit) your plan on any device with a web browser. Copying plan files backwards and forwards by email attachment No effort to set up. Time taken to email plans. Requires careful coordination if more than one person is editing a plan. You have to be careful not to lose changes by copying an old file over a new one. Storing the plan file on a USB memory stick No synchro­nization problems. Requires a USB memory stick. Only one person can be accessing the plan at any time. Shared network drive. On Windows a plan will be locked when one user has it open to read. Other users will only be able to open it as 'read only', preventing conflicting changes. You will be notified if your 'read only' plan is updated by another computer. Requires access to a shared network drive. File locking can be restrictive when you have multiple users trying to access a file. 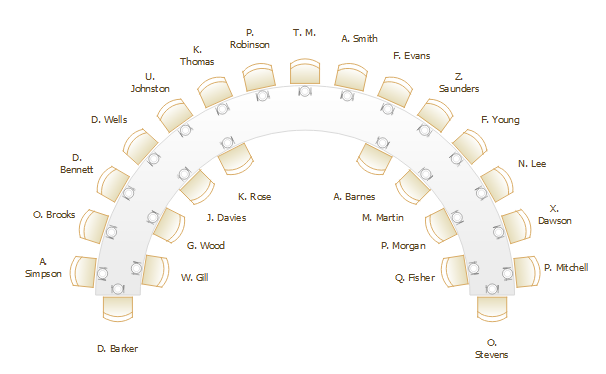 File locking is not supported on the Mac version of Perfect Table Plan. Store your plan in Dropbox, synchro­nised across all your machines. Changes on one machine are auto­matically synched to all other machines. Conflicts (.e.g. two users making changes to the same file at the same time) are handled auto­matically. Easily manage sharing with other users on a plan by plan basis. You can still access your plan even if you have no Internet access. Dropbox keeps a 1 month history of changes and allows edits and deletions to be undone. Works across Windows and Mac. Requires a small amount of effort to set-up. Changes only sync to other machines when you have Internet access. If 2 users simultaneously edit the same plan on different machines at the same time you will end up with 2 versions of the plan. An encrypted copy of your data is transmitted to and stored on the Dropbox server. This may not be appropriate for highly confidential plans. Dropbox requires a payment if you want to store more than 2GB of file. Dropbox is our preferred approach. It works really well, even for multiple users across multiple computers, and it is easy to set up and (in most cases) free. Note that you need a licence key for each PerfectTablePlan user. Enter the email address you used to purchase PerfectTablePlan. 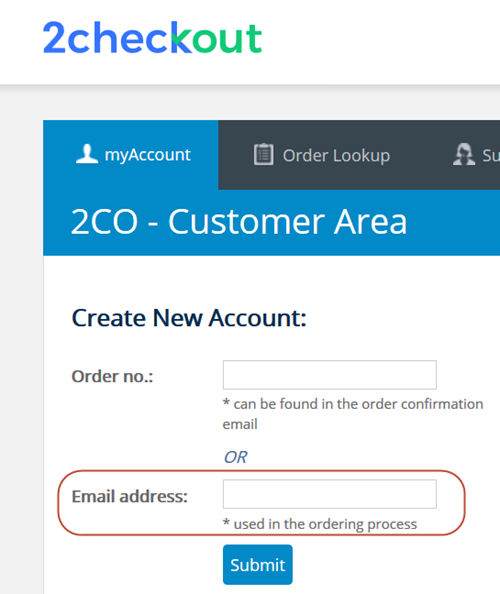 You should then receive an email from 2Checkout. Follow the instructions to access your account. Once you have accessed your account you should be able to print a formal receipt. If you have any problems please contact 2checkout.com . Each different version of PerfectTablePlan is treated as a different program. So you can have as many different versions installed as you like. For example, installing v6.0.1 won't overwrite v6.0.0. Just uninstall versions you no longer need. If you have previously added a valid licence key to your computer you shouldn't have to add it again for a minor upgrade. You need to associate plan files with the appropriate PerfectTablePlan program. This is normally done for you during installation. But you can also do it yourself. Right click on a plan file (extension .tp). Click on the Change... button next to Opens with. c:\program files \PerfectTablePlan_<v> \PerfectTablePlan_<v>.exe (where <v> is the version) and click Open. For Mac see How can I change what program opens a certain file on a Mac? The Windows installer is available as a .exe file and as a .zip file. We don't have a .msi installer, but we understand it is possible to repackage the .exe as a .msi using EMCO MSI Package Builder. The Mac installer is available as a .dmg file. PerfectTablePlan for Windows is a standard Win32 executable like Excel or Word, so it shouldn't be a problem. We haven't tried it ourselves, but customers have told us that it works fine. The Export Control Classification Number (ECCN) for PerfectTablePlan is EAR99 (encryption functionality limited to intellectual property or copyright protection functions). There may be a problem with the Windows registry entry. This can sometimes be fixed by installing a new printer (e.g. a virtual printer, such as PDF creator) or removing and reinstalling an existing printer. If your printer has more than one driver, try choosing the Postscript driver. All such changes are at your own risk. Pay as usual through our online payment processor, 2Checkout, then send your tax exemption documents to pay@2checkout.com to request a refund of the tax charged.